I have stored my PA14 in my garage on a Trailex trailer with the Hobie cradles spaced at 67" since April of 2012. I have had no issues with hull deformation. I'm looking for a bit of advice as I am thinking of buying a Triton LXT-LK kayak trailer with a 2 place mast kit for my PA 12. I've been offered a decent discount on a new trailer. I have some reservations how it would work with the PVC method in this post. The spacing between the arms/cross bars to support the PVC is 81" and I'm concerned if this is too much. I have 4" grey electrical conduit PVC already I can use. I understand it holds up to sun exposure better. The mast kit has short vertical posts dividing the middle of the arms, so when I am only carrying the one PA it has to be on one side. It can not be centered on the trailer and I don't know if over time or long trips this could be a problem. I'd like the versatility of carrying an extra kayak for my daughter or a friend but I would mostly just trailer the PA alone. I could always add some weight to the other side to even the load. If anyone uses one of these trailers please let me know how you like it. I'm getting final package costs with accessories next week. Last edited by Sidemadder on Sun Sep 02, 2018 4:52 am, edited 1 time in total. The spacing between the arms to support the PVC is 81" and I'm concerned if this is too much. I have 4" grey electrical conduit PVC already I can use. I understand it holds up to sun exposure better. The mast kit has short vertical posts dividing the middle of the arms, so when I am only carrying the one PA it has to be on one side. It can not be centered on the trailer and I don't know if over time or long trips this could be a problem. I'd like the versatility of carrying an extra kayak for my daughter or a friend but I would mostly just trailer the PA alone. I could always add some weight to the other side to even the load. I purchased the Triton LXT-LK6 for transporting our tandem island, a cargo box and up to 4 other sea kayaks. 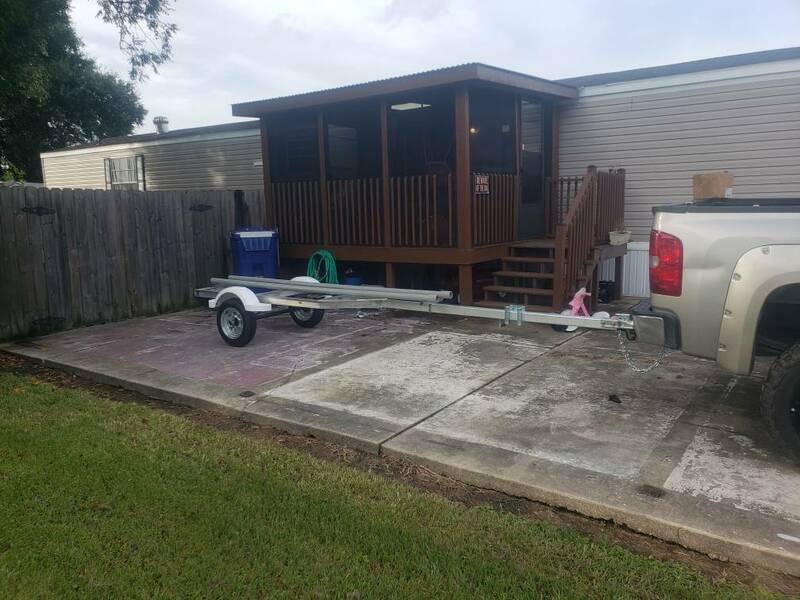 It is a well built trailer with a galvanized axle, submersible hubs/lights, 12 in wheels, 2 inch coupler and 1265 lb capacity--weighing 235 lbs. For the tandem island, I used the hobie cradles for the Tandem Island mounted onto 1 1/4 in PVC pipe, slip lined with wood closet rods--like fusoneng has recommended. You raise good issues. The trailer length is 15.75 ft--so there is overhang front/rear for the tandem island--I used 10 ft of the reinforced PVC to reduce the unsupported length. This way I can mount the hobie cradle spacing about 69 inches apart. I am away from home at the moment, but can send a pict on my return. Yes, the 4 ft cradles need to be outside of center--increasing the trailer width by about 6 inches. The aluminum cross arm are 2 inch square, 1/4 in. I am thinking about putting a brace between the lower two arms and the frame to help reduce flexing/fatiguing the cross arm. Thanks for your feedback on the trailer. The PVC slip lined with rods is an interesting idea. One concern I forgot to address is the lack of a bow stop. How are those with this type of trailer securing their PA"s? For example, on an unavoidable fast stop you don't want it flying forward! In addition to the cam straps across the yak, is a strap from the rear handle to the back of the trailer enough? Then a strap from the front handle angled towards the tongue of the trailer to control backwards slippage I am guessing. Thanks for the information and pictures. How far apart are the crossbars that support the PVC on your trailer? That is a major concern I have with the trailer I am considering. It's crossbars are 81" apart. I don't know if this is going to be a problem. 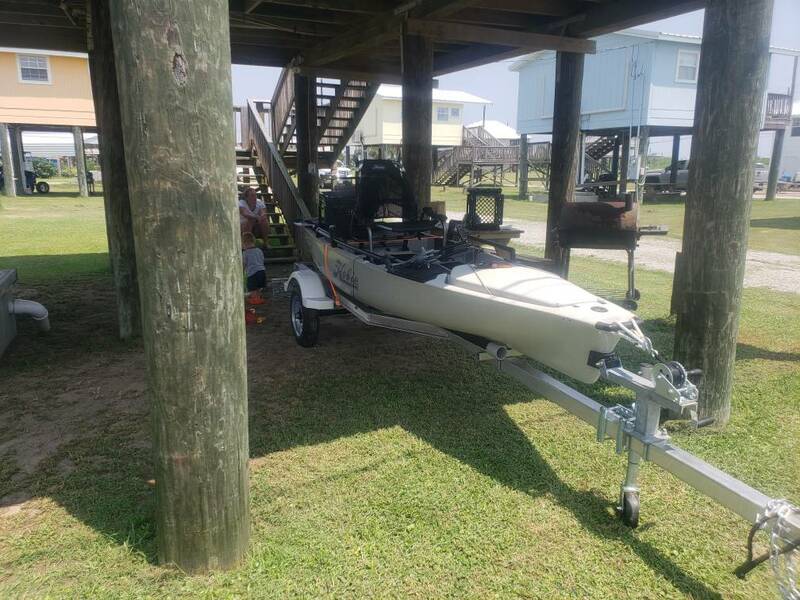 Also, I have a couple other smaller paddle yaks that I am wondering how I am going to rig the J saddles in a closer proximity on the other side of the double trailer. 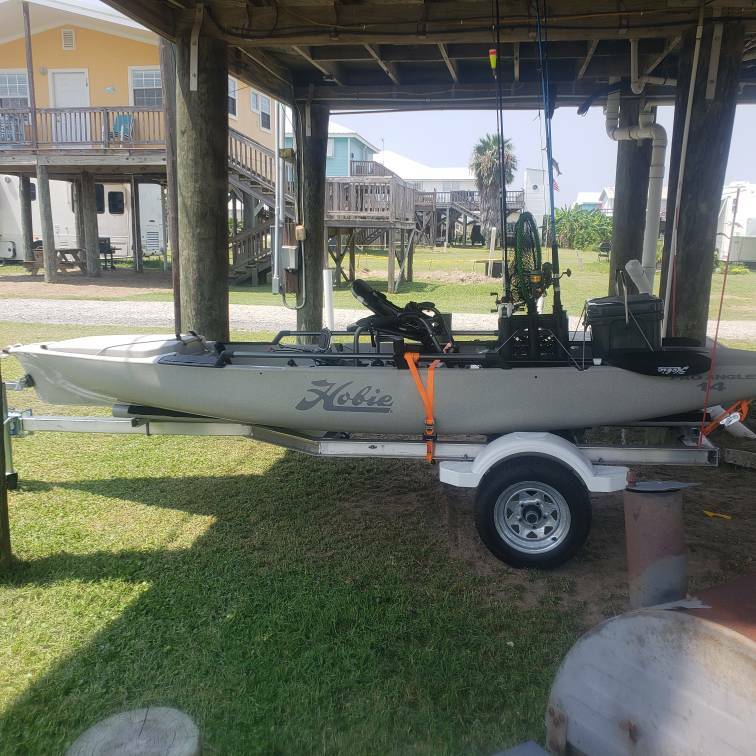 My goal is to add a couple of hooks on the trailer's rear -- to hold a Hobie TI dolly; in order to easily mount the TI on the dolly, as it slide off the rear; then wheel it off the trailer; then easily un-mount the dolly, once back onto the trailer. Also plan to put in a 3 ft wide tool box on the longitudinal racks in front of the Saris cargo box. I am not as concerned with using a bow stop--other than potentially being an anchor for a winch. The TI is held from forward movement by running the hold-down strap around the front of the aka bar. Same with all other canoes/kayaks I have ever transported on racks--hold them down with two straps and use a third as backup on long trips. All suggestions welcome. . .
Last edited by itiming on Sun Sep 09, 2018 6:46 pm, edited 4 times in total. I appreciate the additional pics and info. What is the black material you used to extend the cross bars under the cradles? Did you just bolt them to the arms? I was able to re-purpose two 3 ft long aluminum Saris bicycle rack trays. They have a slot through the center of one side to hold the carriage bolt heads and are 2 inches high, to offer enough stiffness.